For over two years Climate Interactive has been working with Tsinghua University in China to create a learning tool to model the climate goals of Chinese provinces. Because of our work with Tsinghua, they have been able to provide the Chinese government with a new easy-to-use tool in order to meet their climate and energy goals. China has committed to a 40-45% decrease in the carbon intensity of the overall Chinese economy by 2020. In order to meet this goal the Chinese government and provincial leaders set targets for the provinces to adjust their GDP, energy intensity, and fuel mix. To create true engagement from the leaders at all levels, however, there needed to be a shared understanding of how to reach these goals, and methods for calculating progress. In order to create a tool to track the progress of the Chinese provinces, a team led by Professor Zhang Xiliang at Tsinghua University began using system dynamics models, the technology of which grew out of MIT Sloan School of Management and is behind C-ROADS. The system dynamics models are a contrast from the spreadsheet models that were used to set the targets, which are not geared towards flexible “what if” testing. What they sought was a user-friendly, interactive simulation such as C-ROADS, which has been used by multiple governments as part of the UN climate change negotiations. Professor Zhang’s Low Carbon Economy team had the data, an understanding of the Chinese energy system, and a staff of modelers to create the tool, but their partnership with the Climate Interactive team enabled them to put these elements together to create a successful model. 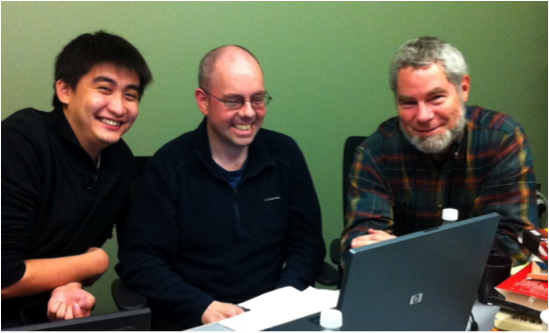 With the support from the Rockefeller Brothers Fund and Zennström Philanthropies and building on relationships cultivated by Peter Senge, Climate Interactive worked with Tsinghua Professor Zhou Li, Xiaohu Luo, and professors at MIT to construct the core simulation in January 2010. 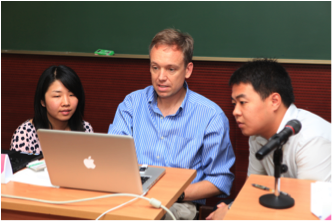 The Tsinghua team then improved the simulation back in Beijing, and in the summer of 2011, Climate Interactive’s Drew Jones traveled to China to support the Tsinghua team in presenting the work to provincial leaders assembled at Tsinghua. The leaders were quite excited to have such a flexible and useful tool, and made many suggestions on how it could be improved. Through the rest of 2011, Xiaohu continued to improve the core mathematics behind the simulation. 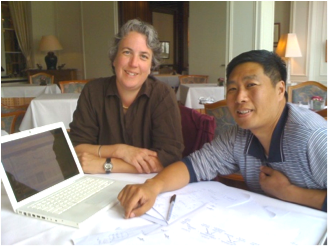 During this time, Climate Interactive’s Beth Sawin also met with Zhao Xiusheng of Tsinghua University in Bonn, Germany, and later in Geneva Switzerland collaborating on climate simulations, exchanging data, and discussing approaches to analyzing greenhouse gas emission reduction pledges in the Copenhagen Accord. In order to put the icing on the cake, that is the user interface on the model equations, a team assembled at the MIT Sloan School in Cambridge, Mass. last December. The group included: Climate Interactive’s interface guru Dr. Phil Rice, Tsinghua University’s Xiaohu Luo, Climate Interactive senior modeler Dr. Lori Siegel, and Vensim interface programmer Tony Kennedy. Over three intense days, the team built a graphical user interface for the China Provincial model, 分省模型, developed over the previous year. With much hard work, our Tsinghua colleague, Xiaohu Luo, was able to leave Boston with a new user interface (see below) that allows people to use the model without any technical knowledge of the Vensim software that it is built on. 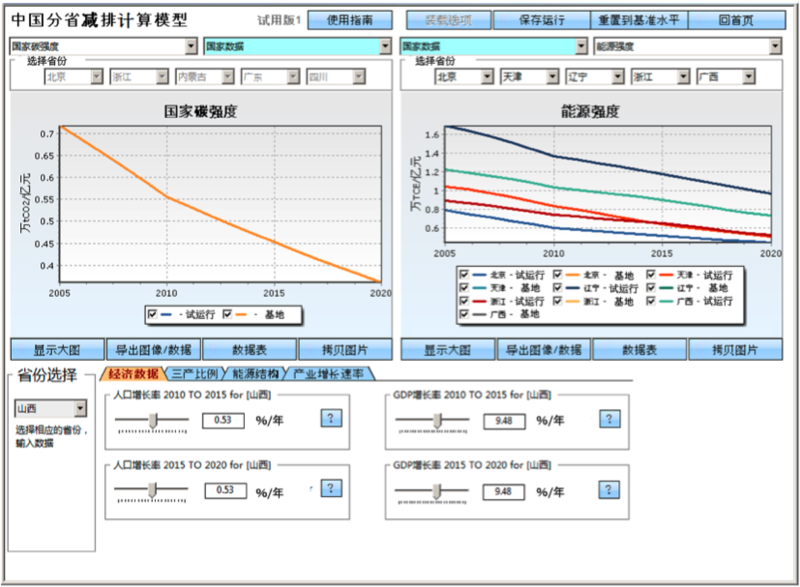 This interface allows provincial leaders to enter their province’s energy plans and get feedback about how they are doing to meet the Chinese national goals for carbon intensity improvement, it also allows national leaders to add up the progress of the 30 provinces included in the model to see how close they are to reaching their climate goals. The success of this project is due to the strong relationships built with working with the same team over many months, the high level of expertise, and the clear goal that we were working toward. In the future, “funding willing”, we are exploring the possibility of adapting the provincial simulation so that it could be used on a mobile phone or on some other easily shared format. We are also considering the possibility of developing an English/Chinese energy and climate model of China that could be built off of our experience developing the En-ROADS model.